Nitrite is the second step the nitrogen cycle and is dangerous for fish and other livestock so it to must be tested for and properly handled. 1. Add with the syringe 1ml of water in the test vial. 2. Add to 1 level spoon of the NO2 powder. Swirl the contents of the test tube gently for 20 seconds. Allow to stand for 3 minutes. 3. Place the open test vial on top of the color chart on a part of the chart which is white and compare the colors looking from the top. 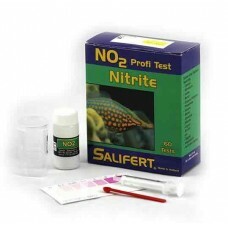 Read the corresponding nitrite content. An intermediate color corresponds to intermediate nitrite content.